Can Other Faiths Bring You to Heaven? She was joking, and I know the theologian she is taking the class from, so I know she will learn the unique richness of the Catholic faith. When you die, you will meet Jesus. He will perhaps look “like a lamb who is slain.” Or he might look like that other image of him in Revelation, the one in the National Shrine in Washington actually captures quite well. In any case, he will be off-putting to a great many people — but I hope and pray not to you and me. We know Jesus rose from the dead. We know he was either Lord, lunatic or liar; we pick Lord. So we won’t be surprised to meet him when we die. But we can imagine that a lot of other people will die when we do: Orthodox Christians, Protestants, Jewish people, non-Christians, atheists. How will the experience be for them? This Good Friday at the Veneration of the Cross service we will pray the great intercessions for all of them, from most true to least. We will pray for all Christians: Their baptism into Jesus Christ will prepare them well for that moment, but we should pray that their rejection of Peter or the sacraments won’t be insurmountable obstacles. We will pray for the Jewish people: At the moment of death the chosen people will finally meet their Messiah and see in that lamb the final form of the Passover they have so often celebrated. We should pray that they won’t object too strongly to the fact that Gentiles are welcomed in with them. You may be standing next to a good Muslim at that moment. He will have learned some true things about God that will help him: God is one, and wants our submission. But his prejudices might stop him from embracing Jesus. St. John Paul remembered one Muslim with him in a cathedral telling him: “But nothing can compare to our magnificent Muslim monotheism.” The Muslim next to you might wince reflexively at the reality of the Trinity. He might struggle that God is calling him to submit not to the Unseeable Unknowable One, but to a slave — because that’s the form Jesus took when he became man. But she could also easily be repulsed by Jesus’s embrace of suffering. And she might be unable to recover from the very fact of the encounter itself. She expected non-being, not an intense encounter with the Source of Being. She spent a lifetime preparing for the end of personhood. Will she be able to embrace a Divine Person? An elderly Hindu priest might die with you and have the same problem: Most Hindus will have expected this moment to reaffirm their belief that the material world is an illusion. Instead, he will encounter the Word made Flesh. Incarnation is the antithesis of Eastern religion. How will the Hindu react? The argument at the heart of Stephen Prothero’s book God Is Not One would suggest that dying and meeting Jesus will be an awkward moment for nearly everyone you are with: they will all have become accustomed to thinking of God in very different ways. Everyone except the Catholics? Well, let’s hope so. This is where the real value of your “comparative religions” class comes in. Islam knows about God incompletely, but they often put us to shame as regards submission to his will. Hindu devotions may look wild and crazy but we can learn from their sincerity and intensity. Buddhist spirituality is negation. That’s not enough, but it’s an important first step that Christians often miss. The truth is, many Catholics will not rush into the arms of Jesus either. The road is narrow and the gate is small and few find it. 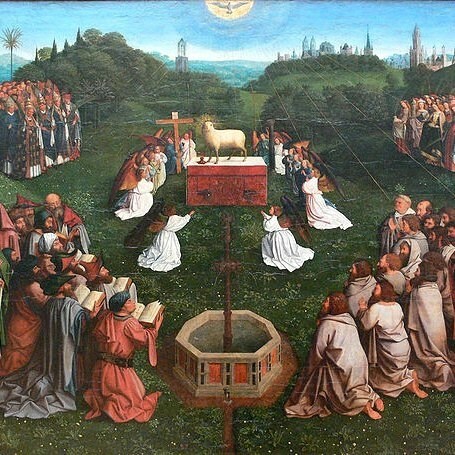 That’s because our Catholic faith has uniquely revealed to us the terrible secret to our salvation — the real reason Christ looks like a lamb who was slain and a judge separating sheep from goats. The secret? God is love. And in the end we will only be able to stand in his presence if we have lived in his love. When I worry about that day, I worry that I have done far too little of that.